I had computed the convex hull of all the pixel corners, and then I computed the pairwise distance between every pair of convex hull vertices to find the maximum distance. The procedure would work fine in many cases, but the time required to find the maximum distance this way grows with the square of the number of convex hull vertices. With modern digital image resolutions, it's not hard to imagine having thousands of vertices and therefore millions of pairwise distances to compute. A line of support for a polygon is a line that contains a vertex of the polygon, with the polygon lying entirely on one side of the line. Let me show you a picture using the convex hull points from last time. 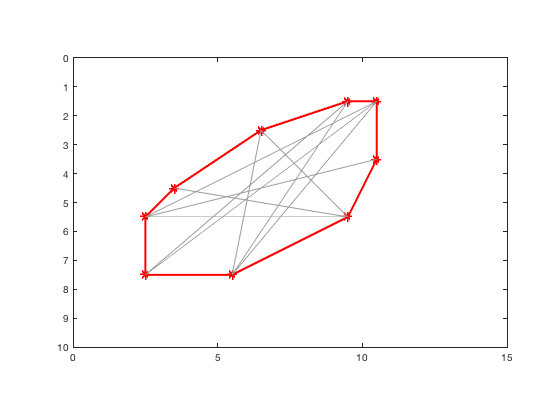 The plot above shows five different lines of support drawn through the (9.5,5.5) vertex. Now I'll add some of the lines of support through the (2.5,7.5) vertex. You can see that there is no line of support for the (2.5,7.5) vertex that is parallel to a line of support for the (9.5,5.5) vertex. That rules out this pair of vertices for computing the maximum Feret diameter. Now I'll draw lines of support for a different pair of vertices. Because the vertices (6.5,2.5) and (9.5,5.5) have parallel lines of support, they are called antipodal vertices. There is an algorithm in the Preparata and Shamos book (referenced above) that finds all the antipodal vertices for a convex polygon. There's an implementation of the algorithm in a function at the bottom of this post. I'll use it to find all the antipodal pairs of the convex hull vertices. Important note: the algorithm in antipodalPairs assumes that its input is convex. Further, it assumes that the input does not contain any vertices that are on the straight line between the two adjacent vertices. 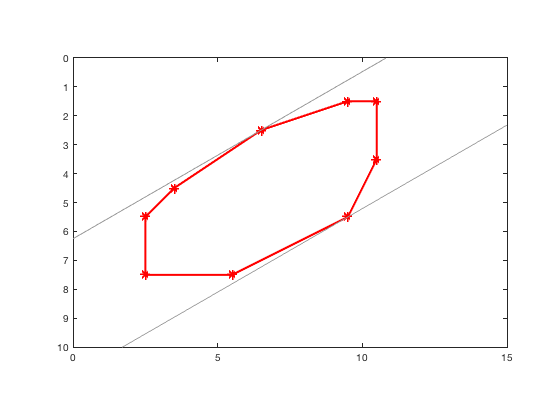 To satisfy this condition, compute the convex hull using the call: k = convhull(P,'Simplify',true). 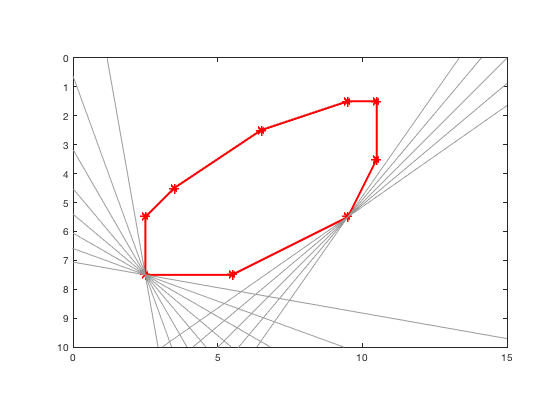 Now let's plot the line segments joining each antipodal pair. To find the maximum Feret diameter, we only have to check the distances of these 10 segments, instead of 10*9 = 90 line segments as before. And there is the maximum Feret distance. I am sure that, in many cases, it would be quicker to find the maximum distance by brute force comparison of all pairs off convex hull vertices. The computation of the antipodal pairs does take some time, after all. I have not done a performance study to investigate this question further. However, the antipodal pairs computation is useful for another measurement: the minimum Feret distance. I will look at that next time. %    to the line function. 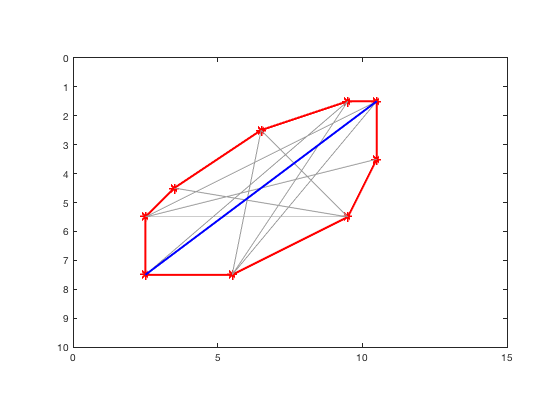 % antipodalPairs Antipodal vertex pairs of simple, convex polygon. %   lines of support are parallel. %   that the interior of the polygon lies entirely on one side of the line. 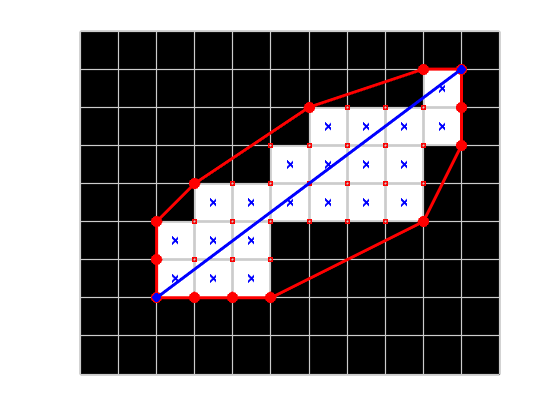 % The algorithm assumes the input vertices are in counterclockwise order. % If the vertices are in clockwise order, reverse the vertices. % and S(k,:). next(p) returns the index of the next vertex of S.
% The initialization of p0 is missing from the Preparata and Shamos text. % The list of antipodal vertices will be built up in the vectors pp and qq. 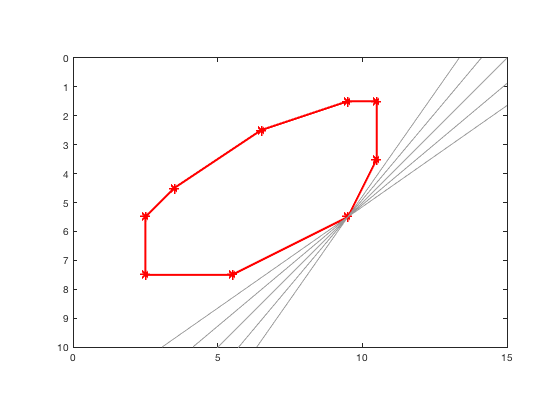 % ANTIPODAL PAIRS step 3.
q0 = q;    % Step 4.
while (q ~= p0)    % Step 5.
p = next(p);   % Step 6. % Step 7. (p,q) is an antipodal pair. q = next(q);    % Step 9. % Step 11. Check for parallel edges. % Step 12. (p,next(q)) is an antipodal pair. % Compensate for the flipping of the polygon vertices. % vertexOrientation  Orientation of a vertex with respect to line segment. %   line. It returns a negative number if P2 is to the right of the line. 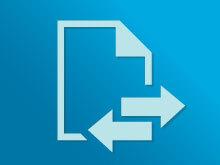 %   counterclockwise traversal from P0 to P1 to P2. %   P0, P1, and P2 are two-element vectors containing (x,y) coordinates. % simplePolygonOrientation  Determine vertex order for simple polygon. %   matrix of (x,y) vertex coordinates. % Find rightmost lowest vertext of the polygon. Copyright 2017 The MathWorks, Inc.
Cris—Thanks for your input. You might be right. I haven't had a chance to carefully profile and measure. Also, I enjoyed your 2012 post on this topic. I'll probably link to it in my next post. Interesting. Waiting and looking forward to the next post on minimum Feret diameter.